For centuries Venice was a global influence on the arts and architec- ture. At the heart of this city, one of the most beautiful in the world, is the famed Piazza San Marco, with its ingenious blend of spaces, volumes and styles. It is fitting that Marge Carson named its fabulous April 2010 case goods introduction, Piazza San Marco. This extensive 24-piece collection of stunning bedroom, dining room, living room and occasional furni- ture brings the finest of Marge Carson's fashion, design and finishing talents to the forefront. Piazza San Marco is a return to a traditional style, that blends supreme elegance with livable formality. Accessorized and accented with hand cast hardware, metal leafing, and exotic woods this collection is introduced with a deep, rich finish called Old World Orleans and a new lustrous polished metal leaf finish called Versailles. Truly, Piazza San Marco is Marge Carson at its best. "It has been a long time since Marge Carson has brought to market an elegant, very dressy collection," said company president Will Sharp. "Piazza San Marco represents the heart of Marge Carson - It is very elegant. Case goods are appointed with beautiful custom hardware. Carvings are enhanced with silver leafing that showcases the brilliant finishes and artful hand painting. The details are phenomenal. It is one of those rare furniture collections that is even better appreciated up close." 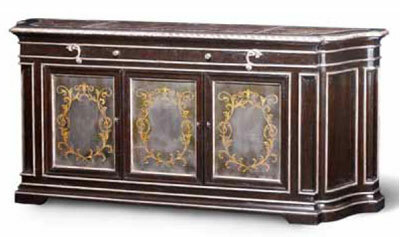 This 90"credenza embodies the romance, style and elegance that is Marge Carson's Piazza San Marco.  The curve of the elegantly shaped ends frame three deeply molded doors. Each door features antiqued mirrored panels with a subtle hand painted interlaced acanthus leaf design in a metallic silver. Optional metallic gold or veneered wood panels can also be selected. The credenza's sinuous shape is further accentuated with a 3-piece insert polished Madeira marble top. Finished in a rich new finish called Old World Orleans with hand applied silver leaf trim, this serving piece makes for a dramatic backdrop to any dining experience. Dining in the round is always an equalizing experience. 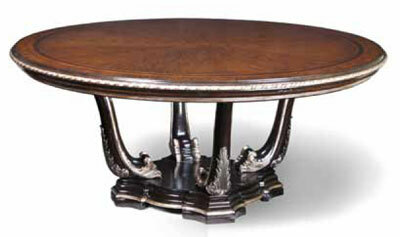 But it is hard to equal this magnificent 84"diameter Piazza San Marco dining table by Marge Carson. The shaped base supports four sweeping tapered legs detailed with acanthus carvings. The top features an intricately pinwheeled ash veneer surface that is framed at its border by inlayed walnut, cross banded ash and a hand carved rope edging. Available in a smaller 72" diameter as well, this dramatic table is truly dining at its best. Shown here with an Old World Sumatra finish, a contrast Briar top and highlighted with silver leaf trim. Abundantly scaled and well proportioned this three drawer Bombay chest measures 62" in length and is 42" high. 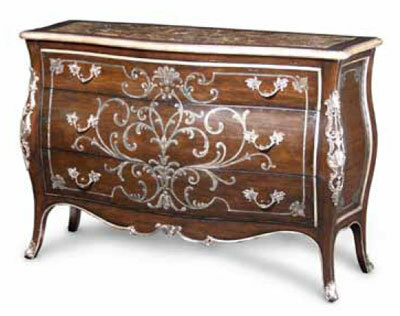 Its exquisite curves are accented with custom ormolu castings. The six intricate, hand cast brass handles also add to the decorative metal detailing. An optional hand painted intertwined vine and leaf design adorns the face and sides in an antiques gold or silver coloration. As a hall chest, bedroom piece or in the grand salon, this beautiful chest is a dramatic focal point. Shown here with inset polished Madeira marble in Old World Orleans - heavily distressed - finish with contrasting silver leaf trim and hand painted silver decoration. Founded in 1947, Marge Carson, Inc. manufactures and markets high-end residential furniture, including upholstery, bedrooms, dining rooms, occasional pieces, mirrors and decorative accessories. Today one of the world's leading privately-held upper-end wood and upholstery manufacturers, Marge Carson's furniture can be enhanced with application of over 55 finishes and more than 600 plush fabrics, trims and leathers. Marge Carson's 28,000 square-foot showroom is located at 121 N. Hamilton St., High Point, NC.